We all know it’s important to have a Will, as this is something that is often highlighted to us, but what isn’t often mentioned is the importance of making sure that Will is properly written and therefore legally binding. Yet, a Will written incorrectly, or not properly witnessed, could be equal to not having written a Will at all, leaving your loved ones with a legacy of taxes, paperwork and legal bills. So, what constitutes an incorrectly written Will? There are many things that could invalidate a Will, or just cause undue additional hassle; from something as simple as spelling someone’s name incorrectly and not using their legal name, to a Will where the wording fails to meet requirements. And whilst you would assume that if you went to a solicitor or even purchased a Will writing kit online the wording would be correct, you could be wrong. “I only have a small inheritance to leave, so will be fine to do my own DIY Will” – often people think this is the case, until they speak to a professional and discover that in actual fact there are more aspects to their estate than they first thought. Not only is there the issue of what you own and choose to leave to your loved ones, but how do you factor in if someone in your Will dies, divorces, re-marries, has more children, step-children…the list goes on. Re-marriage is just one example of where things can get complicated – if you leave everything to your spouse and their Will states that they then pass everything on to your/their children equally after their death, you might assume that would mean that your spouse and children are looked after, right? This wasn’t the case for Stuart Herd, after Stuart’s father died his estate passed to his wife (Stuart’s stepmother), she had written a mirror Will of her husband’s stating that the estate would be passed equally between Stuart and her own son. However, after the death of Mr Herd Senior she changed her Will and left everything to her son and nothing to Stuart, which was perfectly legal, but morally was it the right thing to do? You can read more about that case on our blog here. 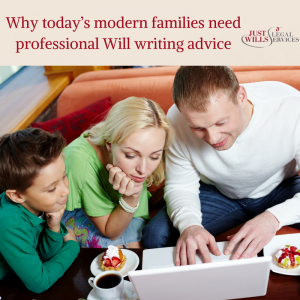 By using a legal professional that isn’t necessarily an expert in the field of Will writing, or using a DIY Will Writing Kit, you run the risk of having an invalidated Will, and not just this, even if your Will is perfectly valid, it does not mean you have received the best advice you could have. By using a trusted and reliable Will writer you are putting yourself, your estate and your beneficiaries in the best possible position for the future – we will guide you through each and every aspect of your Will and ensure that any future change in circumstance is accounted for as best as possible.